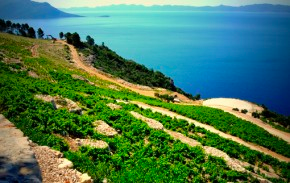 The Croatian Wine Movement Is On The Rise. One of the many contributions Croatia gave the world is the famous Zinfandel grape. In 2002 Carole Meridith at UC Davis confirmed the true origin of Zinfandel. More recently in April of 2017 Jancis Robinson at the Tribidrag Conference discussed the need to name the Croatian grape Tribidrag due to it being the oldest known name for the variety. Go-Wine’s expert on the subject of Croatia, Anton Maletich spent much of September 2017 traveling through this important area. Anton will be hosting a class on Croatia, its wines and cuisine on October 5th, 2017. Please register here to enjoy an immersion into Croatia at Suzette's in Wheaton, Illinois. Over a light breakfast in Wheaton, Illinois I interviewed Anton. Here is a summary of the geology, viticulture, principal varietals, wine styles, culture, trends, and cuisine seen through the eyes of Mr. Maletich’s interview. Go-Wine: What were some of the high points of your visit? Anton: I was able to see the fruit on the vine. I was able to see the Plavic Mali, Babic, Malvasia and other indigenous grape varieties growing during the harvest. I saw a great deal of old style vine growing. Low to ground. No wire training. To my amazement vine pruning was sporadic in many places. Harvest involved stepping over the vines. It was very labor intensive. There were no rows, no paths, and much was on steep slopes in many of the areas. I visited Saint Hills winery, a collaboration with the owners Ernst and Ivana Toji and Michele Roland, on the Peljesac peninsula on the South Dalmatian coast. It offered a stark contrast with new world viticulture and winemaking. Go-Wine: What kinds of soil did you see in the vineyards? 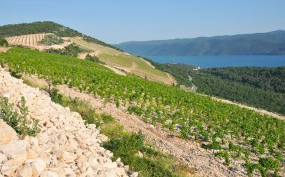 Anton: In the hinterlands, the soils resembled the (Galet) found in the Rhone. In the North where Malvasia is prevalent, red soil was dominant. The Dalmatian coast was saturated in stone. Limestone was also dominant and in my opinion creates the mineral quality in some of the white wines. Go-Wine.Com: What were the temperatures like during your stay? Go-Wine.com: What are some of the dominant red wine varieties in Croatia? Anton: The dominant red grapes are the Plavic Mali, Babic, Dobricic and Crlenjak Kaštelanski (ancestral Zinfandel). Go-Wine.com: What are some of the white wine varieties in Croatia? Anton: Grasevina, Malvasia, Grk, Posip, and Chardonnay. Go-Wine.com: The Plavic Mali and Babic seemed to have made a big impression on you. What are their styles and flavors? Anton: Plavic Mali is a dry, medium bodied, brambly wine with great structure and approachable tannins. We now know that Plavac Mali is a cross between Crlenjak Kaštelanski (ancestral Zinfandel) and Dobricic (an ancient red wine grape variety from the Dalmatian coast) grapes. Babic shares some of Plavic Mali’s style but seems more earthy with aromatic qualities resembling mushrooms, and leather. It sometimes resembles a mature Burgundy. Go-Wine.com: What is the culture of the area like? Anton: The culture is very modern. Music, dress, media, etc. is highly westernized. Go-Wine.com: What were some of the interesting wine and food trends you discovered? Anton: They are making Super Tuscan style wines. They are blending CS, Merlot and Syrah in the North and in Istria. The southern portion remains more traditional. The Croatians know how special what they have is and everything they are producing is world class. They are showcasing it appropriately, and are emphasizing quality. The restaurant community has a micro focus on the local fare. They are willing and proud to show their wares. Go-Wine.com: What surprised you most about the cuisine? Anton: The great secret is that there is incredible value in food beverage to be found in Croatia. You can enjoy a world class experience without spending an in ordinate amount of money. Go-Wine.com: Can you give us some examples of the classic cuisine of the region and recommend some wines for each one? Anton: The coastal and inland dishes are quite different as you can imagine. Coastal Cuisine: The Mediterranean climate and diet dominate the coast. Wood grilled fish, olive oil, and vegetables prevail. The ubiquitous seafood side dish is the Blitva which is composed of Swiss chard, potatoes, olive oil, and garlic. Suggested wine: Local Grk, and Posip from the island of Korcula. 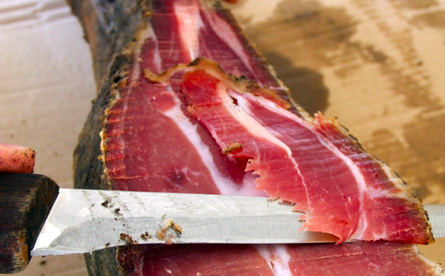 Continental dishes: Inland you find specialty hams like the Pršut. Another traditional dish is stuffed cabbage simmered in tomato sauce. It is typically filled with smoked beef, or pork, and served with mashed potatoes. Recommended wine: Grasevina the largest growing wine varietal made in dry, sparkling, and even ice wine styles. Palacinke: A crepe that can be sweet or savory. Walnuts Chocolate or Ricotta style. Suggested Wine: Prosek which is a Dalmatian sweet still wine made from the white Croatian grapes Bogdanuša, Maraština, and/or Vugava. Go-Wine.com: Thank you Anton are there any last comments about the Croatian wine market? Anton: The future looks bright. 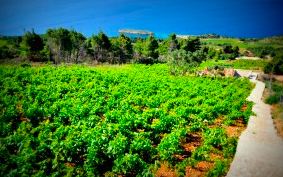 Croatia is making world class wine and food. The main opportunity now is to provide labeling with less challenging pronunciations. The Croatian cultural identity is intact. Zivjeli! Cheers! Plavic mali means little blue one. Babic is a famiy name.